The band born from ex members of SHARKS and Foes, have come together to depict and create a selection of four tracks that dissect the current overreliance on Social Media and use their sarcastically dark manner to deliver their message on the heels of some glitzy punk backing. Social Hell; the element of being stuck in a pigeon-holed void spawned from the sense of being warped in the present day’s focus on over romanticising how we act and perceive one another upon social media. 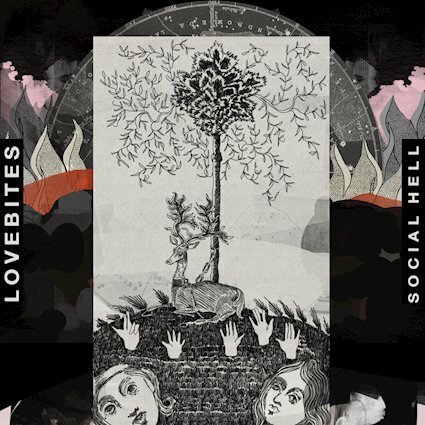 It is this ideology that acts as the bloodstream for Birmingham rockers LOVEBITES’ latest release. The band born from ex members of SHARKS and Foes, have come together to depict and create a selection of four tracks that dissect the current overreliance on social media and use their sarcastically dark manner to deliver their message on the heels of some glitzy punk backing. The DIY ethos of the EP, which was recorded and written from the band’s home Birmingham, is at the forefront but you would be hard pressed to find any kink in this EP’s armour to suggest it wasn’t produced at some glamorous studio in New York. The EP itself oozes coolness and entices the listener to go and steal their Dad’s leather jacket and sing out their grievances with the world at the top of their lungs. The delivery of the instrumentation is crisp and packs enough punch to not fall into the dreaded wishy-washy side of indie punk and Jack Perry’s vocals lend a hand in making each track an enjoyable journey that always peak at the four pieces ability to write infectious choruses. Influences of The Police and The Strokes are clear but these Birmingham punks don’t let their sound become a carbon copy, instead applying their own uniquely refreshing take on a genre that was crying out for a band like LOVEBITES to flip the script. The band may only be a mere few months old but if Social Hell is anything to go by then say hello to the next breakout indie punk band. Hey! I am Brad, the Editor and Creator of AltCorner! AltCorner was built to serve as tbe promotional platform for alternative music - documenting everything from unheard and upcoming artists to world-renowned established acts. Driven by a team of passionate writers and photographers, we strive to make a difference in the music world and give a voice to the artists who deserve to be heard.